Should you test and use training zones to improve your performance? In my opinion Yes, Absolutely. Why? Because you can significantly improve training benefits and race performance/predictability. You will need a watch with capability to record times for pacing zones, a heart rate monitor (HRM) if you want heart rate zones, or a power meter for power zones. Tests for pace and heart rate are included as examples below. 1) Attempt to identify a “best” test or set of training zones for each sport. You need to try some for yourself. I use tests from two texts in my examples, but that’s only for convenience. In practice, I use several different tests for each sport and constantly compare them with results from workouts and races. Don’t forget about races, since they can yield great results because the effort is typically your best. One race example is used below. 2) Design specific training blocks, integrating all the zones. There are many programs on the market, in books and online, and many coaches, that provide this level of detail. This is very athlete specific. So, are you giving me a small piece of knowledge that I can get into but am then unable to use on my own? No. This is a crucial piece of knowledge that is the start of the new and much improved you. Once you have zones, you can begin to investigate workouts and training plans that use them, upping your game via specificity. You can use your zones during group workouts, and understand what zones the coach has you working in. Once you’ve done some training within a plan using zones, you can see how your body responds, vastly increasing what you know about how your body works and recovers. It’s fun! Get to know yourself and race your best! I’m in the middle of my season now. Can I test now or do I have to wait until next year? Test now. There is never a bad time to start. (Okay, doing hard testing the week before your A race is probably not a good idea.) Think of this process as training to train: a new series of events that is overlaid on your season plan, taking the place of some other workouts. If you have three or four weeks, you can have zones for your next race or block of training in one or more sports. What might weeks look like with testing in the mix? Notes: Testing is taxing and you want to be rested coming in. Schedule a day off or easy day between test workouts. You can try to do a workout in a second sport after a test session, but make it very easy, more of a recovery session. This is a sample, and there are many more. They were developed for good reasons. We’ll investigate one for each sport. Note: After reading through the examples below, you will have a feel for how testing works and be able to do it for yourself. If your program or coach calls for a test other than what’s shown, you will understand how it works and therefore be better able to implement it. The tests below, especially for cycling and running, are very common. Frequency: Perform this workout every week for 3-6 weeks. You may swim a set(s) after the test if desired, but do not ‘save’ any energy for them. The test result is all that matters. 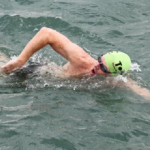 You enter a race (or do a hard group swim) in a lake, or an ocean swim with minimal current. This would NOT be the NYC Triathlon swim. Take your best 1000yd pace and use this as your threshold pace. Numerous tables will give you pacing zones based on a test of this distance. How does this threshold pace compare with what you calculate below from your 200yd test? Note: There is some overlap in zones. If you are closer to 1:15/100yd pace for your 200 time trial, start in the bottom half of the range. If closer to 1:45, start in the upper half. Credit – I first saw this type of test detailed by coach Bill Sweetenham in “Championship Swim Training”, and have modified it to accommodate a wider range of paces, based on my experience. Method: It doesn’t matter how your best 20min HR is attained. Three options are given and the highest average should be used. Some programs such as Training Peaks will identify your best 20min HR segment for you and this is the number you should use. Race a duathlon or sprint triathlon and use the bike portion as an all out time trial (bike should be 10-15 miles). Yes, you’ll be able to run after, but it will test your mettle. Take your best 20min HR for use below. You’re out on a short (1-2hr) group ride and they pretty much hammered it for one half to full hour segment, plus or minus. You were spent and barely kept up. Take your best 20min HR for use below. Note: Already you can see some differences in terminology. Friel lists zones above and below threshold (other charts do not), and Zone 5B is equivalent to VO2max. You have to do some work for yourself in this area to see what different authors are doing. Note: Begin each main set rep easily, allowing HR to rise gradually to TH level over several minutes, then hold steady. The rep (and benefit) begins when you start the effort, not when your HR reaches the zone. Try not to overshoot your zone limits. Run/Race a 10k as fast as possible and note your time at the end. Some programs such as Training Peaks will identify your best 20min HR segment for you and this is the number you should use. Use charts such as the ones in Training Bible to determine HR zones as you did for the bike. Note that when you see workout sets directed in these zones, time spent in each zone will usually be less than or equal to the best effort time. It makes sense that you can’t do 3x30min in TH with 2min rests – that’s way beyond the definition of TH. What you’re really doing in that case is a Zone 2 or 3 session. And you’ll know this when you look at pace, power, or heart rate. OR, if you are able to hold your ’threshold’ for an hour and a half, your zones are wrong and you should retest, expecting a higher threshold number. Sprint – A race that typically lasts 1-1.5hr. Most of your time will be spent in the Threshold Zone. Faster athletes may bump up into VO2max for short periods, while slower ones will spend time in Z3. Olympic – A race lasting 2-3.5hrs – quite the range. Most of your time will be spent in Z2-3. Faster athletes may bump up into Threshold for short periods, while slower ones will spend more time in Z2. Half – A race lasting 4-6.5hrs – again, quite the range. Most of your time will be spent in Z2. Faster athletes will spend time in Z3, while slower ones will spend more time in Z1. Full – A race lasting 8-17hrs – it’s just a different day for the pros. Most of your time will be spent in Z1-2. Faster athletes may bump up into Z3 for periods, while slower ones will spend time all their time in Z1. From this you can see that by knowing your zones you can plan your race pacing, heart rate, or power zones. It makes racing much more predictable, with better results. For example, from your new zones, you may find out from reviewing past data that you were going out at threshold effort for forty-five minutes on the bike of your Half IM races and that killed your run. Stay in zones that work for your race distance and feel better throughout. How do you want your body to adapt? This is a bird’s eye view of what changes are caused in your body by training in each intensity zone. The zones do overlap. While each zone does certain jobs best, the ones adjacent to it impact those areas to a lesser extent.